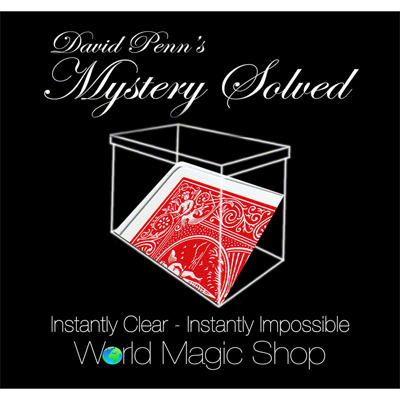 Today, when you order "David Penn's Mystery Solved", you'll instantly be emailed a Penguin Magic gift certificate. You can spend it on anything you like at Penguin, just like cash. Just complete your order as normal, and within seconds you'll get an email with your gift certificate. I made a box like this when I was in high school shop class. Cost me about 2 bucks. Love David Penn but this is sub par for him. I prefer another not so well advertised clear box that is smaller and fully examinable not that most people give a hoot about the box. Again love David Penn and he is quite clever but this is an over priced disappointment. I've performed some form of the mystery card/signed card to impossible location and predictions for decades. I've used envelopes, wallets, paper clips, wooden boxes, mint boxes, jewelry boxes and candy boxes. Thanks to David Penn's Mystery Solved, my search is now over! The construction of the box is flawless and it's secret workings is diabolical. It's so well made that it looks exactly what it is: a clear, little box that holds an isolated playing card, prediction, or bill/bank note. It's perfect for all venues. From close-up to stage, Mystery Solved works. It's small enough to be carried in your pocket, so it's perfect for restaurant and walk around gigs. You can have the box on the table or even have a member of the audience hold the box. The box is completely customizable and items can be changed out within minutes. Of course it's perfect for card magic and you can use ANY brand of cards, with ANY back design. But it is not limited to card magic. The applications for mentalism is unlimited. From routines with paper money to predictions and confabulation routines, Mystery Solved elevates the magic. The legendary Peter Turner is featured on the DVD discussing applications for mentalism. The DVD is beautifully filmed, with crystal clear instruction so that anyone form full time Pro's to Hobbyists can perform their favorite style of magic with it. Mystery Solved isn't just the "latest/newest" flavor of the month trick. David Penn's Mystery Solved is a bona fide game changer! hey, listen guys... if you read some of the lower rated reviews, the comments are true--- you have make PART of your gimmick, and yes, the box seems "overpriced". but let's be real here, this utility gimmick is frickin awesome. so versatile, and im happy to make my own "gimmick" b/c it allows the creative freedom i want from a trick. if you're not super tight on funds, just add to cart... the dvd and all else is great, and i know ill be using this for the rest of my life. SOLD! 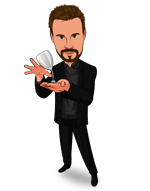 I have used it now for a great ending to the Ambitious Card routine and also for Mentalism. All I can say is get this item it is worth the price and a great utility device for any performer. Get this item. Simple,direct and very good. Disarming audience when you can flip the card above, The fire is an element with punch in front the people and the restoration is jaque mate. This is the best kind of gimickrd prop. No one thinks about it after it performs its function. Great trick. I used Mystery Solved in performance for the first time on Saturday night, inspired by David and Peter Turner to use it for a Dream Vacation prediction, as the closer to a 2-hour act, and it brought the house down. With a handling revealed by David in an extra video he released, it was flawless and absolutely incomprehensible to the volunteer and an audience of more than 60 who were watching. Electrifying result, and my first standing "O"... very happy customer. It's every bit as good as it looks and better. David released an alternate handling filmed by another magician that was absolutely perfect for me. I had a volunteer imagine a dream vacation, picking a place (Egypt), an amount of money she took with her ($3,000), and a celebrity she'd seen there in a hotel lobby (Omar Sharif), while I jotted down the details on a small pad in a notebook. Then she came to the stage as I tore out the notebook page and handed it to her asking her to confirm the details. Then I directed everyone's attention to a podium at the other side of the stage where there was an upside-down wine glass with the small clear plastic box on top of it (Peter Turner's suggestion) that had been in plain view for over an hour, and a folded note inside the box with the words "I had a Dream..." written on the outside. I had the volunteer look closely at the box, then cup her hands, I lifted the box with two fingers, held it over her hands, removed the lid with two fingers of the other hand, and spilled the note out into her hands. SHE opened the note to find it said, "I had a dream that I went on vacation in Egypt, that I took $3,000 with me, and I met Omar Sharif while I was there." She was totally stunned, along with everyone else, including my wife! As always, David Penn delivers! I've used several switching boxes and this is by far the most versatile, easy to use and deceptive. David does a nice job with the instructional DVD and the interview with Peter Turner got my mind racing! The potential alone for billet work and predictions makes this a must have. My ONLY criticism is that the "extra inserts" David provides so that you can customize the object in the box could be better quality and is prone to scratches. The material works just fine, but is a bit fragile. The good news is there's a superior material available at better craft stores in the US. I've upgraded my box for $3 and now it is incredible! I allwayz think this idea but never make it, its simple and powerful potential, ı like it and I think the wait is over.